What a fabulous afternoon. Thank you parents for coming in and working with your children, we are so pleased that these afternoons are so well supported. We will send home all the eggs tomorrow ready for you to display. This entry was posted in Uncategorized on April 3, 2019 by anlabyfoundation. Our new FS1 had their first visitors today. The room is looking beautiful. We currently still have places available for 3 and 4 year olds. Please contact the office for more information. This entry was posted in Uncategorized on April 2, 2019 by anlabyfoundation. Today has been a day of sunshine and fun. We have been making dens, looking at minibeasts, identifying flowers, reading, creating and role play. Happy Weekend everyone. This entry was posted in Uncategorized on March 29, 2019 by anlabyfoundation. Some wonderful pictures and labelling of the character from ‘Scruffy Ted’. This entry was posted in Uncategorized on March 26, 2019 by anlabyfoundation. So pleased to see that the children are using their writing skills at home. 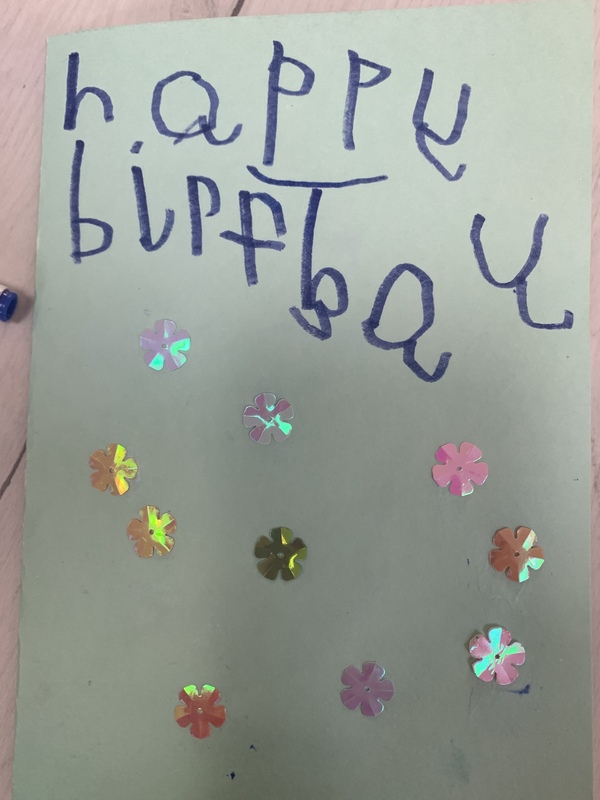 Well done to James who has remembered that there are two ‘p’s in happy even though you can only hear one, and for remembering the ‘ir’ and ‘ay’ phoneme in birthday. Excellent work. Thank you for helping us to raise money for comic relief. We had a lovely day, it was very blustery outside but the children made up their own competitive game, even timing themselves. Happy Weekend everybody. This entry was posted in Uncategorized on March 15, 2019 by anlabyfoundation. We have been acting out the story Where the Wild Things Are. We have been trying to use the language from the book as well as acting it out in the right order. We will be making Wild Thing masks next week. This entry was posted in Uncategorized on March 14, 2019 by anlabyfoundation.